Approximately 24 million people in Africa now speak the Hausa language, from Western Africa across the continent to Eritrea. However, it’s in northern Nigeria and the country of Niger where you’ll find the majority of speakers. It is an Afro-Asiatic language, which means it’s in the same general family as Berber languages and the Arabic of Egypt – languages spoken in the northern part of the continent. It can be written in an Arabic script, known as Ajami. 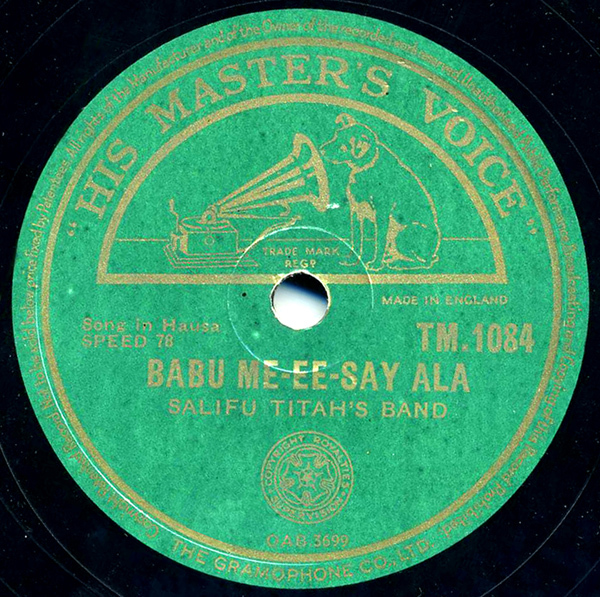 As far as research shows, the first commercial Hausa recordings were made in the Britain in the late 1920s when the Zonophone company, by then an arm of HMV, began releasing the very first recordings for African consumption (as opposed to ethnographic recordings made for study, or for the amusement of Europeans) – most if not all of Zonophone’s releases were actually recorded in England by native Africans, with the records being shipped back to West Africa for sale. There was also at least one Hausa song, recorded in Britain by native Hausa speakers, released on the small Duophone label as well. Odeon may have recorded Hausa material as well, on location, in the late 1920s. In the 1930s, 5 more Hausa recordings were made by Parlophone (by then also an HMV company) on their PO series – raw, rural music featuring the Hausa people’s fiddles, the goje or the kukkuma, with titles written in both Roman characters and Ajami script on the labels. HMV continued releasing Hausa recordings on their JZ series from 1937 onwards. This record was made ca. 1952, and recorded in Nsawam, Ghana. By then, HMV had been joined by a cavalcade of competitors in the West African 78rpm market: mainly French labels such as Philips, Fiesta, Le Chant du Monde, Voice of Africa, Africa Vox, but also Decca, and near-lost independent labels such as Bassophone, Palmo-Tone, Nugatone…it’s quite amazing. There was a tremendous amount of recording going on, particularly in Ghana, Nigeria, and Sierra Leone. But labels also went beyond the popular Creole groups of Sierra Leone and the high-life bands of Ghana and Nigeria, presumably to satisfy emerging markets, or simply smaller ones. HMV’s green-labeled TM series added recordings from Togo, as well as those in less commonly spoken West African languages like Adangbe and Awuna. Which brings us to this Hausa recording, made for HMV and on the TM series. The guitars show an influence of West African pop, but the voices sound real and unpolished. The singers are accompanied by two (?) guitars, drum, and percussion (perhaps a bottle). Alas, I could find no information on Salifu Titah. Beautiful, and a very distinctive sound. I thought the percussion sounded metallic rather than glass, but who knows? The label image doesn’t seem to want to enlarge, by the way.